Cerulean Studios recently announced that the alpha build of Trillian for Mac is now ready for download. Trillian is a multi-procotol instant messaging client and it allows you chat on Windows Live, Yahoo!, MySpaceIM, AIM, Google, ICQ, Jabber, Skype, IRC, and manage your Email, Facebook, and Twitter all together. * Networks: Astra, Windows Live, Yahoo!, Facebook Chat, AIM, ICQ, XMPP, Google Talk, Bonjour, MySpaceIM. * Contact list: identities, groups, MetaContacts, searching, drag-and-drop, inline renaming, avatars, service icons. * Quick ‘click-to-type’ nickname and status changes, including iTunes tracking. * Standard Trillian iconholder and avatar display. 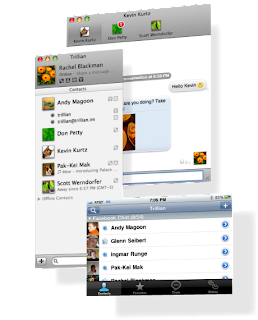 * Smart tabbed conversation windows (tabs on demand) with typing indicators, bubble view, emoticons, links. * Login screen and support for multiple accounts. * Basic preferences screen, connection manager, full suite of per-connection preferences. * File transfers and a file transfer manager. * Activity history framework – logs are being written to disk in standard Trillian format (XML, LOG). * Support for most standard Mac hotkeys for flipping through windows, opening preferences, etc. * Basic dock integration and badging. Developer Cerulean Studios says they are still working on Social network "feed" integration for Twitter, Facebook streams), Mail integration, customization options, Group conversations, Growl integration, “Status Item” support, Activity history viewer, Voice and video support and Setting your personal avatar. But those features should be out soon and you can look out.